Posted on Mon, Nov 7, 2011 : 7:08 a.m.
IOWA CITY, Iowa — There is one question Michigan football coach Brady Hoke surely will face in the aftermath of his team's second loss of the season. The sophomore safety played superbly this season alongside junior Jordan Kovacs, and the pair combined to form Michigan's best position group. Their ability to keep balls in front of them and create turnovers — Gordon has picked off one pass and recovered a team-high three fumbles — held the defense together, even when Michigan wasn't playing as well early in the season. Now, Gordon finds himself benched? Thomas Gordon played on special teams against Iowa, but not at his usual safety spot. The sophomore did not make an appearance on defense — not one snap, according to the official participation report — in Michigan's 24-16 loss Saturday at Iowa. Although, he did play on special teams, which effectively rules out injury for his absence. Instead, it was fifth-year senior Troy Woolfolk who started alongside junior Kovacs, and he never left the game. It was his second consecutive start there since he was supplanted at cornerback by true freshman Blake Countess. Against Purdue two weeks ago, Woolfolk started for Kovacs, who was out with a knee injury. Gordon also was back there. The big question heading into the Iowa game was, who would be the odd man out once Kovacs returned? Most though it would be Woolfolk, the newcomer who hasn't played particularly well this year. Coach Brady Hoke was asked last week about Gordon's role with the team once Kovacs returned, and with Woolfolk at safety, and he said Gordon might find himself in more nickel packages. However, that didn't happen either, as sophomore Courtney Avery continued as the regular there against Iowa. Woolfolk certainly has a role on this defense — he is a veteran with great speed, after all. But how can Gordon — who remains the team's second-leading tackler, despite not playing last week — not once leave the bench? And, in the end, how did Woolfolk play against the Hawkeyes? Not bad, but not great. He missed several tackles and took several bad routes to ball carriers, a problem that has bothered him for much of the year. Gordon, certainly, has played more effectively at safety. So, if Gordon was playing well, and Woolfolk isn't, then why would Gordon be benched in favor of Woolfolk? Maybe it's coincidence. Maybe, it's not. Michigan went seven games this year with Kovacs and Gordon as its starting safeties, and never allowed a play of 40 or more yards. In two games since, it has given up three. Woolfolk and Gordon were the safeties against Purdue, with Kovacs out with his injury. Against Iowa, it was Woolfolk and Kovacs. There may or may not be a correlation between the lineups and the 40-yarders ... but there's no question Gordon and Kovacs played well together in the first seven games, especially in containing big plays and creating turnovers. Need more proof Countess is the real deal? Didn't think so. The true freshman was Michigan's best defensive back against the Hawkeyes, including fellow starting corner J.T. Floyd. In fact, it wasn't close. Floyd, who has played well this year, was caught in soft coverage several times against Iowa star receiver Marvin McNutt, and was beaten. Countess, conversely, played more aggressively against the senior — despite a 6-inch disadvantage — and was more effective in coverage. McNutt has been one of the Big Ten's best receivers the past couple years, and he weighed declaring for the NFL after last season. Countess, meantime, couldn't buy a lotto ticket until two days before Michigan opened camp this year. Yet, the freshman with only one previous start played without fear. Now, it appears he's beginning to dish some out himself, as Iowa went away from Countess on several key third-down attempts. Regardless of whether that was done purposefully, the fact offenses are not picking on a true freshman corner is sign enough Countess is viewed as a legitimate threat. Illinois could present a good barometer for Countess' growth next week, as it features another big-time receiver in A.J. Jenkins. It might be in the Wolverines' best interest to defend Jenkins with Countess as much as possible. They don't typically match up a specific corner on a specific receiver, but perhaps now is the time. Offensive coordinator Al Borges has come under fire for his playcalling, and some of it justified. Some are on board with the multiplicity of the Michigan offense, others are discouraged by a lack of flow. Here's the deal: Running the deuce formations and trick plays, and varying the looks and calls as much as possible — even alternating between spread and pro-style looks — is in Michigan's best interest because it already is so one-dimensional with quarterback Denard Robinson. He can run consistently (for the most part). He can't pass consistently (for the most part). Defenses already are creeping into the box with spies and extra defenders, daring Robinson to pass. That's called cheating, and it gives the defense an edge. Imagine how much more cheating defenses could do if they didn't have to spend time preparing for deuces, or for multiple looks? Now, here's where there is a problem with the playcalling: Tailback Fitz Toussaint began the day with some tremendous runs, a few of which were power plays up the middle on which he followed the blocking of new fullback Stephen Hopkins. 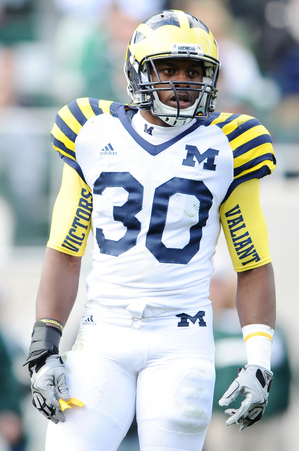 The Wolverines had great success with this look — but instead of sticking with it, Borges got multiple. Toussaint received more than two carries on two drives, and Michigan scored on both of them. He got only five carries on the Wolverines' other nine drives, and the Wolverines scored once (although he did leave the game early with an undisclosed injury). Because of who Michigan is, it has to provide as many looks as possible. But when something's working — especially on the road, in a tough place to play, against a team that's beaten you twice in a row — you have to stick with it. Exploit it. Instead, Michigan never really got back to Toussaint — at first by choice, then by force because of its late deficit. The Wolverines finished the game with 13 consecutive pass plays. The silver lining in the loss? Michigan's defense continues to be uncannily tough in third-and-short situations. The Wolverines allowed Iowa to covert only two-of-five third-down attempts of 3 or fewer yards, and also held on a fourth-and-one. That's a conversion rate of just 33.3 percent on short third- and fourth-down tries. Two of Michigan's biggest defensive plays came in such circumstances. Most notably, linebacker Jake Ryan blew up a third-and-one play with little more than 2 minutes left and the Wolverines trailing by eight points. He dropped Coker for a 1-yard loss, which forced Iowa to punt and gave Michigan one last chance to score. It almost did, thanks to Ryan. "At times, we rose up and played pretty good third- and fourth-down defense," Hoke said. "The third-down stop there late was huge. ... I think they were 4-of-12 on third-down conversions, which, defensively, is OK."
Overall, Michigan is 47th in opponents' third-down conversion rate (37.9 percent) and No. 1 in the country in red-zone defense, which accentuates how good its been in short-yardage situations. Big Ten teams struggle on the road. Young teams struggle on the road. Michigan, which is starting three freshmen on defense, and playing five, is struggling on the road. Both of the Wolverines' losses have come away from Ann Arbor, and have played some of their worst football in hostile environments. They have won three of 12 quarters away from Michigan Stadium, and looked rattled against Michigan State and Iowa. The Wolverines were much better at Northwestern, but Ryan Field was at least 50 percent behind Michigan in that game. Not exactly intimidating. The Wolverines, as it happens, hit the road again next week to face Illinois. The Illini have lost their past three, which seems to bode well for Michigan. On the other hand, Iowa was coming off an ugly loss to Minnesota, and that didn't work out so well for the Wolverines. While Countess was been the most impressive freshman, linebacker Desmond Morgan was the biggest disappointment against the Hawkeyes. He lost contain several times, leading to chunks of yards for Iowa tailback Marcus Coker, and also missed a tackle on Coker's first touchdown run of the game. Coaches speak highly of him, and he's obviously shown something in practice, since he supplanted a junior, Brandin Hawthorne, in the starting lineup. And, although the team went to Hawthorne with Morgan struggling in the first half against Iowa, it went back to Morgan in the second half. He has talent and good instincts, but also has been more susceptible to youthful mistakes than some of his classmates. Three games in a row, Michigan has allowed a first-drive touchdown (and in the game before that, it allowed touchdowns on Northwestern's second and third drives). Clearly, something is not working. It's difficult to criticize much about the defense, considering how far it's come in less than a calendar year. Who could have projected this team would allow just 15.7 points per game after the carnage inflicted the past three seasons? Yet, the slow starts are puzzling, considering how effective the defense has been late in games. With two tough teams and another road game left to play, Michigan needs to find a solution if it's to finish the season with more than seven wins. Michigan is good, but not good enough to consistently come back against Big Ten teams. Mon, Nov 7, 2011 : 5:31 p.m.
Kyle, I agree with HeartbreakM, great job by you covering the team, thanks for keeping it interesting and very good analysis on your part. As far as the team is concerned, yes many things were frustrating, but our team is staying in ball games even when not playing great, a true testament to how much better they are. Think about it, with a little luck and more focused play in our 2 ROAD losses, we could be 9-0 and ranked near the top 5 in the nation, amazing! Just think about how could we're going to be when the coaches have had more time to work with these young men. We're headed in the right direction for sure, with that being said, I have to say that Thomas Gordon needs to be in the game, he's been great this year. I hope the coaches figure out the Safety quagmire and soon. I think Borges is a great OC, he just needs a real passer to show how prolific of a play caller he is, it's too bad really that he is handcuffed by a dynamic player like Denard who has his downfalls, it's just a tough situation for the coaches. I commend them for making our team so much more competitive so quickly. Come on Blue, let's win these last 3 games and put ourselves in position to be there in the end, Go Blue!!! Mon, Nov 7, 2011 : 4:31 p.m.
&quot;Now, here's where there is a problem with the playcalling: Tailback Fitz Toussaint began the day with some tremendous runs, a few of which were power plays up the middle on which he followed the blocking of new fullback Stephen Hopkins. The Wolverines had great success with this look — but instead of sticking with it, Borges got multiple.&quot; That's a great point, and I was wondering the same thing during the game. We had it going with Fitz and the running game, and early on it looked like he would have another 150+ yard game, like he had against Purdue. But then we went away from it. It didn't make any sense then, and it still doesn't make sense now. Mon, Nov 7, 2011 : 6:14 p.m.
Bludogg97, even before Fitz got hurt we went away from the running game that we were doing well with. As Kyle said, Fitz got 2 or more carries on only 2 drives, and we scored on both of them. I believe we should have stuck with the power running game that was working well, and then when Fitz got hurt it would have been great to see Rawls come in and keep it going. I really like Fitz and Rawls both. Oh well, it's easy to sit here and second guess things. Mon, Nov 7, 2011 : 4:57 p.m.
Mission Fitz injured his shoulder late 2nd qtr,and never returned.. I think this is where Rawls comes in,there's no time like the present to give the Freshmen a shot..
Mon, Nov 7, 2011 : 3:11 p.m.
How big of a failure will this year be if this team loses out? There is a very good chance of that happening. I am very impressed with Mattison &amp; Hoke, but Borgess not so much. There were a number of plays of Sat. that DR could have ran and picked up big yardage. Why did DR not have a run pass option at the end of the game. 9 out of 10 times he gets in on a roll out. Instead he is sticking in the pocket and throwing horrible passes. Not worried about this year or next. Year three they better contend for the BT championship. Mon, Nov 7, 2011 : 2:40 p.m.
Well, I was way off on my thought of what Michigan would do on sat. What a horrible effort and execution by the Coaches!!! It is pretty simple Michigan, if you play like that again you wont win again! I would love to go on about individual players not doing a good job but I honestly think that is unfair! The ones that played were asked to do way more than they are capable of and I think that is completely rediculous of a coaching staff to do! Especially Al Borges!!! Stop asking your QB to throw the ball more than 5 yards. Stop asking your back up running back to hit the hole hard, he is delicate and is best utilized in open space when Iowa only has 5 guys on the field! Stop asking your Oline to block aggressively with some autherity they are very tired after this many games! For goodness sakes stop asking your Wr's to catch the ball, that is way to much to ask when their hands are so tired and sore from the season! Mattison- Stop asking your LB's to fill the right gaps and to take good pursuate angles! Stop asking your older corner to cover someone! And STOP asking your safeties to take a good angle at a runner!!! These things are only allowed and capable in the the SEC by Bama or LSU! Brady- Stop being aggressive! How dare you ask your offense to execute at least one play on its first series that you have been scripting for the last week. Stop yelling at the officials and there obviously good calls through out the game especially in the pass intereference category! It is just unbelievable that a coaching staff would put that much pressure on a team! Actually asking them to perform against a team that is mediocre at best! After all of the sarcasm at the end of the day there were 3 guys that played better than everyone else. Martin, Countess and Touissant. Everyone else looked like third string players for MSU! Mon, Nov 7, 2011 : 3:50 p.m.
Could it be that frosh playing is not totally a head coach decision under Hoke, but left up to the coordinators? Maybe mattison is more comfortable playing frosh while Borges is not? I don't think any of us would complain about Borges if Denard hits a few of those long bombs, because those passes could change the tenor of most of these games. Other than the Illinois game last year, did DR try those types of passes? I agree that Borges has not been outstanding this year, but let's give the team time. Kyle: do you have any research on how many frosh Borges has played at his prior stints as OC? Mon, Nov 7, 2011 : 3:04 p.m.
Mon, Nov 7, 2011 : 2:36 p.m.
if Fitz is hurt, I want to see Rawls behind Hopkins on those power plays. I was VERY pleased with the physicality of Hopkins at fullback, I think that needs to be our bread and butter. (and I'm sure it will be as personnel arrive). I believe that Thomas Rawls has more potential than any of the tailbacks at Michigan, his only issue is that he's a wide eyed freshman, just like Desmond Morgan and Blake Countess were weeks ago, but once you inject quality PT and repetition you start to see that growth and confidence arrive. now they are integral parts of our (pretty good) defense. What is to lose? this team, this season can only be SO good with Denard at the helm. We should cultivate our young players on offense . I'm happy Hopkins will be leading the way for 2 more seasons after this, he really hits the hole with authority and force, and when you add a bowling ball 219lb 5'10 Thomas Rawls behind that, well ill just say it's hard to lose yardage. also, RR's spread offense is not the answer. its garbage. so stop it, because I'll never forget the sickness in my stomach when i saw the day when Michigan stopped playing physical football. the spread is never coming back, god willing. Mon, Nov 7, 2011 : 4:53 p.m.
Mon, Nov 7, 2011 : 1:06 p.m.
Tough but fair enough. I was wondering about Cam not playing and Fitz can getting carries too. Especially with Iowa's defense thin and banged up I thought the running game would wear them down. Something doesn't add up. Hopefully they will figure it out for Illinois. Mon, Nov 7, 2011 : 1:21 p.m.
Mon, Nov 7, 2011 : 1:02 p.m.